Cazart! 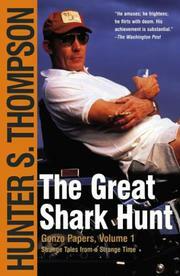 It's Hunter Thompson again. . . or still, in artifacts from his 15-year-magazine oeuvre--including 100 pages of his Rolling Stone Watergate screed--and in patches of both sprees of Fear and Loathing (in Las Vegas and On the Campaign Trail '72). Down from his peak, Thompson's still playing anti-hero in his own journalistic shenanigans: freaking out on booze/acid/hash/speed/the works; macing adversaries, bamboozling everyone else; betting madly on whatever he's covering--Kentucky Derby to Democratic Primary, most recently the first Ali-Spinks bout; then "lashing together" a story with the same old words (shitrain, geek), tricks (Raoul Duke, Sports Editor), excuses (but now we're off the point, unquote). . . and dubbing the diffuse result Gonzo. As though that explained it. Get the idea? It wears thin, times have changed, and above all it's not so much funny as noisy. Thompson belongs in the same cultural reliquary as the Easy Rider, Tom Wolfe, and his new journalism. What's interesting is the older stuff--short pieces mostly, more controlled (or less uncontrolled)--pre-Gonzo National Observer dispatches from South America and our own West (one each on hobos and Hemingway expose an otherwise masked sensibility). Thompson talked football once with candidate Nixon, who wasn't just pretending to be a regular guy: he knew his stuff. Maybe that's why he comes out of here "dishonest to a fault," while as late as 1976 Hubert Humphrey is the "rotten, truthless old freak." Reruns--and wearisome.